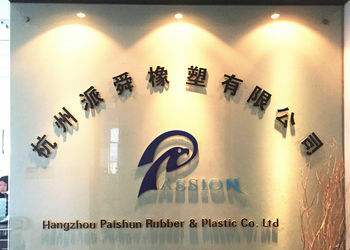 Hangzhou Paishun Rubber and Plastic Co., Ltd established in 2007, is a rapidly growing enterprise who integrate the production and marketing of rubber industrial hoses, rubber hydraulic hoses, and hydraulic hose fittings. After 8 years effort and development, now we have become one of the leading rubber hose manufacturers and suppliers in China. We have been enjoying high reputation in rubber industrial hose and hydraulic hose market domestically and internationally. 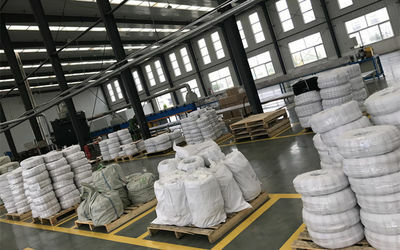 Our factory focus on manufacturing Rubber industrial hoses, which include Rubber air hose , Rubber water hose , LPG gas hose , twin welding hose , rubber fuel hose. Our stock-shared factory focus on manufacturing Rubber hydraulic hose , which includes SAE 100R1 , SAE 100R2 , SAE 100R7/ R8 , EN856 4SH , 4SP , SAE 100 R9 , R10 , R12 , SAE 100R14 Braided PTFE hose , Hydraulic hose fitting and ferrule; Air conditioning hose ; Refrigerant charging hose . We are very professional and have full experience in crimping fittings and quick release couplings on hoses. Such as rubber air hose assembly, contractor garden hose assembly, washing machine hose assembly, LPG hose assembly, hydraulic hose assembly, high pressure washer hose assembly, paint spray hose assembly, etc. We are capable of supplying our products in various kinds of packaging according to customers’ specific requirements. Now our rubber hoses and hose assemblies are exported to USA, Canada, Italy, UK, Norway, Russia, Spain, Portugal, Denmark, Australia, Japan, Thailand, Sri Lanka, Peru, Brazil, Venezuela, South Africa etc, about 50 countries all over the world. 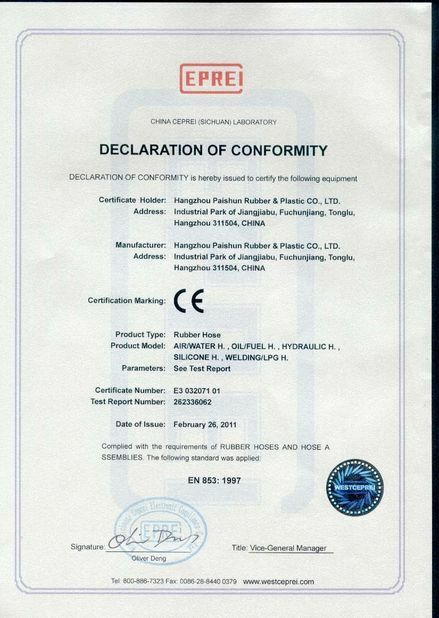 PASSION® Rubber hoses are approved by CE, SGS, TUV. 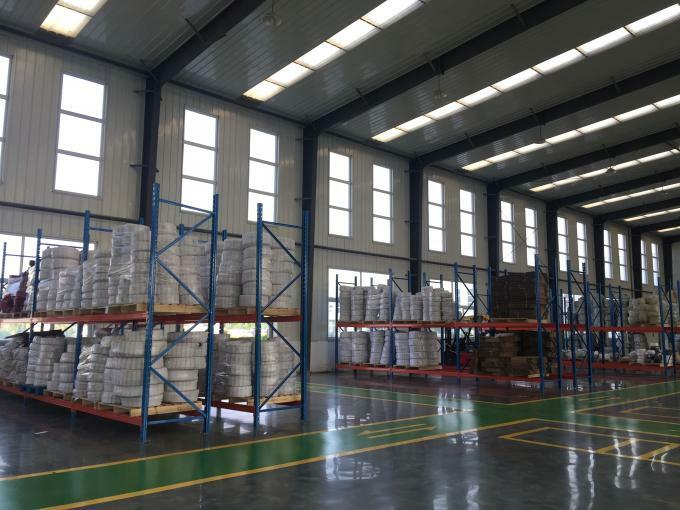 But Hangzhou Paishun has never stopped going forward, in order to supply more rubber hoses to our customers and enlarge the production range, in 2012, together with our partner, we build another factory, which produces silicone auto rubber hoses in Jiangsu China. Hangzhou Paishun sales office has 5 professional teams, Financial department, Documentation department, International sales department, Domestic sales department, Inspection department. 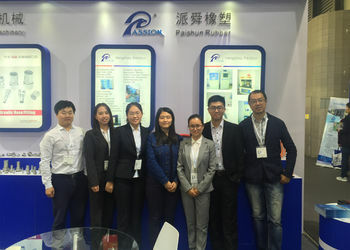 Hangzhou Paishun factory has 5 main experienced and professional teams: Project procurement section, Labor service section, Technology section, Production department, Quality inspection section. Hangzhou Paishun’s staff always believe in “ PASSION FOR HOSE, PASSION FOR YOU! ”. Quality and Service are always the top concern in Hangzhou Paishun. We are always trying our best to offer the best service and competitive price based on the good hose quality. It’s the way we win our customers and the market. Given chance and full space, we would show you all of our advantages and let’s grow up together. Hangzhou Paishun is sure that we can establish long-term and friendly business relationship with your esteemed company because of your trust and our excellent service and hose quality. 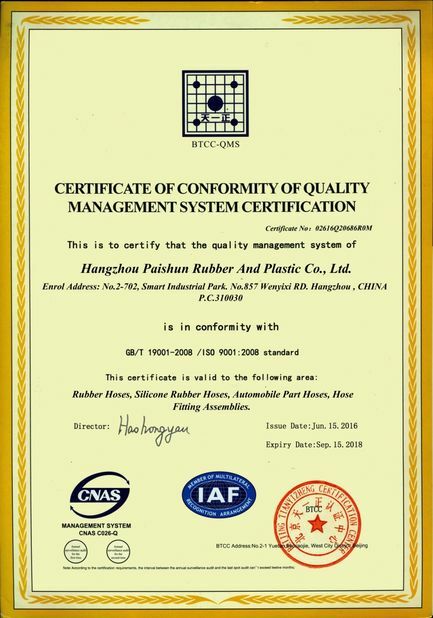 In February 2007, Hangzhou Zhou Paishun Rubber and Plastic Co., Ltd was established in Hangzhou By Mr. Jazk Zeng. The office was in Ego Mansion Hangzhou. Since 2008, we started to cooperate with South Africa's leading mining company for hydraulic hoses R1 and R2. Since 2009, we started the cooperation with our USA and Canada customer for Rubber Air hose and Rubber water hose assembly. 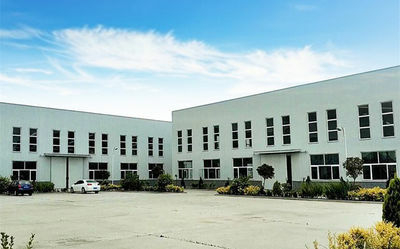 In April 2010, Hangzhou Paishun Rubber hose factory is established in Tonglu Hangzhou. At the same year, our brand PASSION® is registered. And we move the office to Xixi Creative Building Hangzhou, near Xixi Wetland in Hangzhou, the world top wetland with an excellent environment. Since 2010, we started to cooperate with our Venezuela customer whose name is Mangueras Industxxx Mxxxx C.A. for hoses and fittings. A large and well-known company in Venezuela, with their own brand “ IxxxL”. Since 2011, we started to cooperate with our UAE customer for a large quantity of welding hose and gas hose with the brand “ Weldxxx”. Since 2012, We started the cooperation with our Norway customer for EPDM hoses, which is used for their precision induction machine, high quality standard. Since 2013, we started to cooperate with Australia’s Top on-line seller KOGAN sourcing. Since 2013, we started to cooperate with our UK customer for rubber LPG gas hose with their brand “Silverline”. Since 2014, we started to cooperate with our Peru customer for Hydraulic hose with the brand of “ SAEFxxx”. In 2015 September, Hangzhou Paishun office moved to Hangzhou Smart Industry Park. Hangzhou Paishun Rubber and Plastic Co., Ltd is a professional manufacturer and supplier which specialize in the rubber hoses, includes Rubber Industrial Hose, Rubber Hydraulic hoses, etc. 1. We have a professional engineer and inspection team, which ensure our own technological hoses and reliable quality for our customers! 2. For any customers who have a special request for some hoses, just let us know, we can produce the hoses according to your request for size, design, package, etc. 3. For any customers who send us the samples of hoses and fittings, we will make the mold and develop the same or the better ones based on the samples. 4. We can offer free samples for regular products to our customers. 5. We are manufacturer, factory, so we have had the ability of mass production. Our regular hoses are made according to ISO 2398, EN 559, EN 853 standard. CE approved. There are imported test machines in the factory. Such as pressure testing, UV testing, etc. Our working team and sales team can guarantee a fast and high efficiency after-sale service for our hoses and fittings sold to everywhere of the world. Once there is any inconvenience was bought from our products, please contact us soon. We can ship the goods by sea, by air, by courier. We have long-term cooperation ship agent, so the offer for ship cost is very competitive. No matter you want to choose the fastest way or the cheapest way, we can offer you support. TT, L/C, PayPal, WesternUnion, MoneyGram, you can choose the way you like. 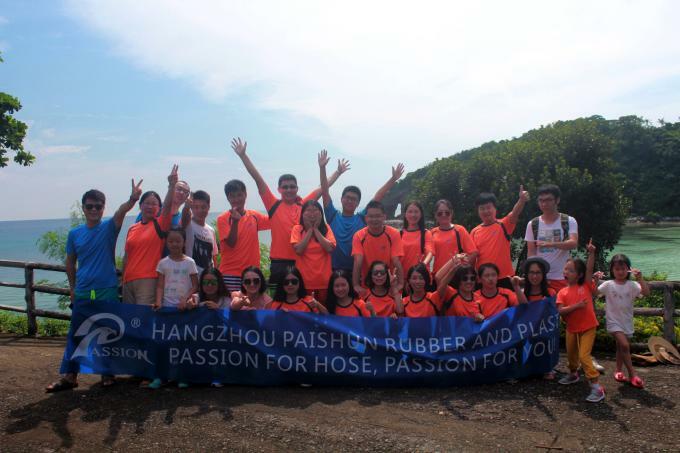 Hangzhou Paishun’s staff always believe in “ PASSION FOR HOSE, PASSION FOR YOU!”. Quality and Service are always the top concern in Hangzhou Paishun. We are always trying our best to offer the best service and competitive price based on the good hose quality. It’s the way we win our customers and the market.